FROM VEDETTE SHAPEWEAR! For all the mommies out there, young or old, you deserve to take a break and have a day or two to unwind and pamper yourself! And as a way for us to celebrate the Mother's day, we are having an easy and exciting giveaway to all of you! Open to anyone! All you have to do is spot this photo on VEDETTE FAN PAGE this Sunday May 12, 2013 and follow the mechanics written!!! 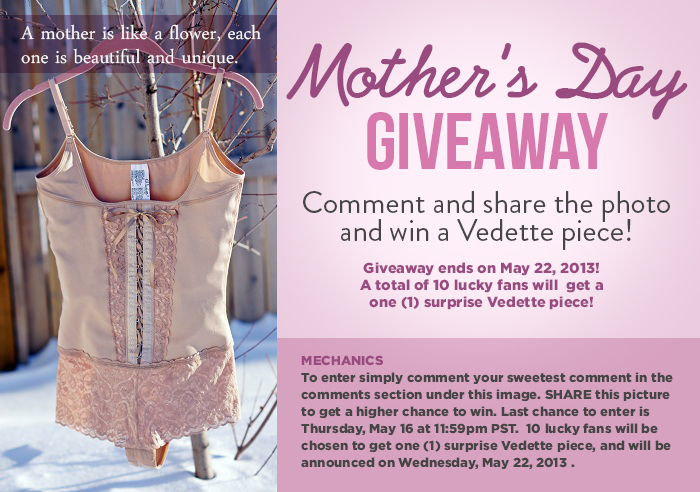 10 lucky fans would be pick to win one (1) Vedette Shapewear each!